OLDRIGHTIE: Are the rats leaving? Do we really want or need him? Is he just a chancer? My instincts say no and yes! "If the rest of the country knew what we were being paid, there would be tumbrels on the street and heads carried around on pikes." A quote from this man. Didn't stop him though. Mr Cameron, please don't take on board these fair weather friends. We need people not tainted by Labour. Whichever way you spin, Labour are toast! To be fair the man did write our welfare to work proposals. 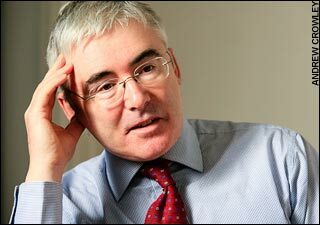 It was only when the government spotted the benefits of our plans that they nicked Freud back. Whilst I am sure your antennae (is that right - I think I'm getting dyspeptic?) are working well, I gather he is more of an ideas man than a political creature. The fact that he wants to work for the Conservatives must be a good thing. Chris Grayling used many of his ideas before Purnell started to purloin them. Better in bed with us than sleeping with the enemy? Thank you both for the comments. You have moved my position! Pete, I was born in West Brom!